I just recently bought a 1967 Volvo P1800 with AC. Back in those days, 'factory air' consisted of an aftermarket unit that was installed by the dealer. In this case it was a Frigiking unit found on a lot of Benz/BMW/Volvo cars from the 60's and 70s'. The unit actually still works and is still charged with R12 judging by the fact the valves are still R12 style. The thing is, I'd like to remove it. The main reason is that it hits my shift hand and my right leg while I'm driving. Also, the compressor is a beast and I'm sure it's robbing valuable HP from an already underpowered car. But I'd still like to have AC in my car, so here's my plan and I'd welcome any feedback on it. 1. Evacuate the system of R12. Where do I get this done? Any AC shop? 2. Remove the underdash evaporator, the compressor and the drier unit. 3. 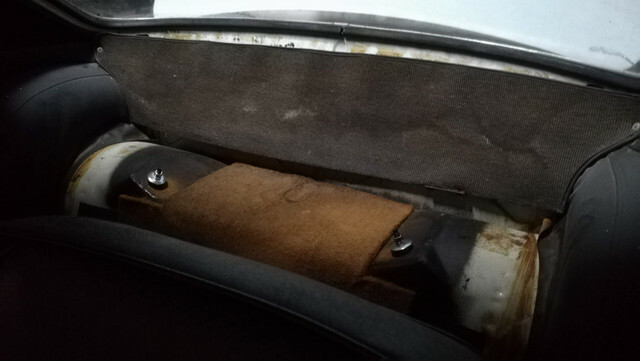 Relocate the evaporator to a spot just behind the rear seats between the shock towers. It would fit perfectly here and a custom vented cover would cover it nicely. 4. Remove the switches from the Evap unit and mount them under the dash by running longer wires. 5. Replace the compressor with a Sanden unit. 6. Install a new receiver/drier. 7. Install longer hoses to hook it all up. Now, if you look at the compressor image, you'll see that this system doesn't use proper fittings, just hose clamps that seem to be these. So to hook up old and new parts, I'd either need to use fittings like these and use standard hose clamps, or try to find flat fittings and use the AC hose clamp. Or buy the not-so-cheap press-flitting tool and make the proper ends to mate to the Sanden compressor and the drier. So, experts out there, does this sound like it will work? Would R134a work in a system with an old evaporator and condenser and these old style hoses? Or should I use Freeze12? The compressor only "robs" hp from the engine when engaged. When not engaged, the pulley rotates freely. Or just remove the belt from old York compressor. 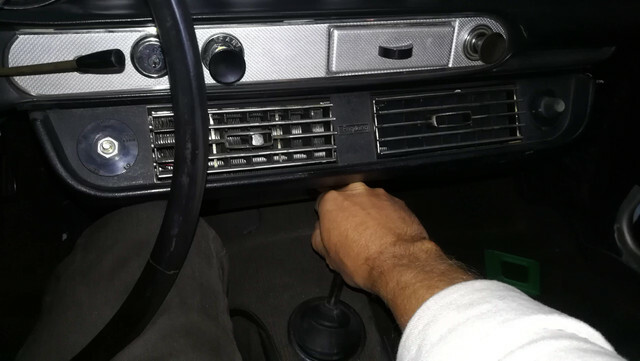 You can likely heat and bend the gearshift lever so your hand doesn't hit. I bent mine on my 1979 Toyota truck so my youngest could sit in a car seat in the center, so I could still shift. We heated it, and bent it, then re-installed. A modern AC compressor will use significantly less engine hp; you could retrofit to something modern and get adapter hoses. R-12 is still legal to use and plentiful in USA. Most cities have several independent garages that still do USA. I know some in Phoenix area. The biggest issue with the AC is actually the fact my knee hits it while driving. I have to twist slightly and it's not a comfortable position. I appreciate the creative ideas about the shifter. It's amazing what you'll do to accommodate a child seat when you have a 2-seater. 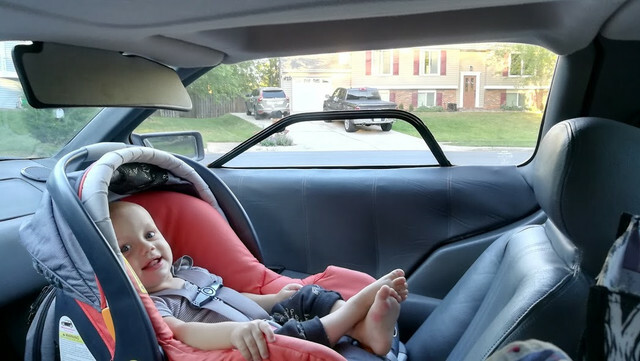 I made a custom mounting system to put a car seat in my Delorean. If I do replace my compressor and drier, am I correct in assuming that these will work with the other parts of my current system? Provided I use the correct oil in the new compressor? What would you suggest doing with the fittings? A real AC shop, and many machine shops, can make new hoses for you that fit. Some will re-use your end fittings. The York compressor is probably geared down to suit the application - how big is the crankshaft pulley? 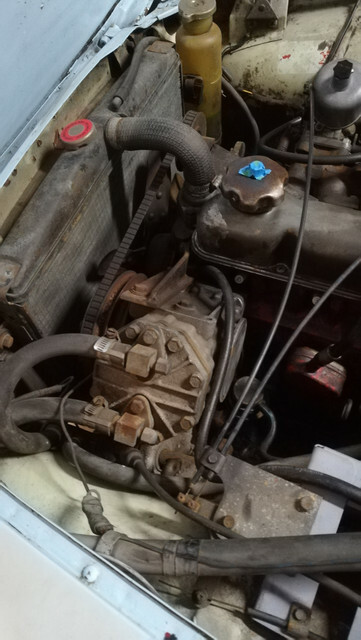 Any direct mount compressor could be adapted to that mount - but direct mount compressors tend to have serpentine belts so a clutch change would be needed. A V5 for instance would be a great choice, but only if you can fabricate the mount, swap the clutch... AND the crank pulley is big enough. You could just leave well enough alone - it is not leaking & it is the right vintage. Brand new units are still available. Look closely at your dryer, it may have wrenched on fittings that have hose barbs, or it may just have barbs. A replacement is available regardless. I would buy some hose, and move the evaporator. Check the oil in the compressor & go for it - with R12. If you plan to switch refrigerants, drain the compressor & flush it with some ester oil & refill it. Then charge with 134a. Freeze12 is not worth the effort. You say the system runs now, but it is charged with unknown gas. So obviously it still holds pressure with hose clamps. Just because the valves are R12 does not mean it contains R12 Many of the propane snake oil sellers did not change valves or mark anything. Having said that, I would stay with R12. It is still available. Have your system recovered & move the evaporator where you like - can it go to the right far enough to solve the problem?